Augusta, GA – March 2013… Since 1804—when Thomas Jefferson was President of the United States and Lewis and Clark were exploring the newly purchased Louisiana Territory— First Presbyterian Church has been meeting the spiritual needs of people in the Augusta area and around the world. Music plays a prominent role in the church’s worship activities and to ensure the best possible sound quality for all involved, an impressive assortment of wireless technology from Rio Rancho, NM-based Lectrosonics is utilized. Brandt Fincher serves as the media consultant at First Presbyterian Church. He specializes in location audio recording, audio for video post-production and mastering, as well as film scoring, video production and media integration for distance learning. With this background, he is a natural choice to assist First Presbyterian Church in their efforts to improve their sound reinforcement capabilities. He discussed the project and his decision to deploy Lectrosonics’ Quadra IEM systems as well as the Digital Hybrid Wireless UM400a beltpack transmitters and HM plug-on transmitters in conjunction with the company’s Venue receiver mainframe and VRT receiver modules. 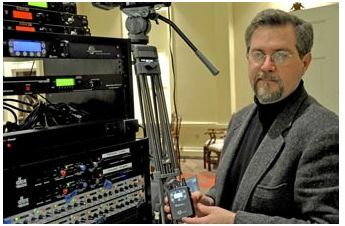 Fincher’s choice of the Venue receiver system addressed the church’s space limitations with equal aplomb, “As is the case with both the Quadra IEM’s and the wireless mic transmitters, the Venue system doesn’t require as much rack space as many other systems. The Venue receiver setup was yet another space-efficient choice that addressed our requirements very well.